Located in the heart of the Peace Country, we are a company with a passion for hard work and high quality. We strive for excellence in everything we do and make customer satisfaction our number one priority. We are fully trained and certified in many areas and strive to exceed our customer’s expectations in every aspect of the projects we undertake. We supply trucking, picker, and pilot services to the oilfield, mining, and farming industries. We have specialized equipment to complete our projects safely and effectively. We at Ledarco Construction and Trucking Ltd are dedicated to practicing safe work procedures and keeping a positive, proactive attitude to those we come in contact with. Ledarco holds CWB, COR, ISNETWORLD, and COMPLYWORKS certifications. 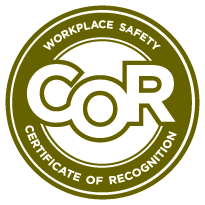 We strive to maintain an exemplary safety record and quality through continual improvement. Our main location is just a few minutes west of Grande Prairie, Alberta and the majority of our work is performed in Alberta and Northern BC. However, we are also authorized to operate across Canada and the United States. No job is too big or too small for our dedicated team to accomplish!